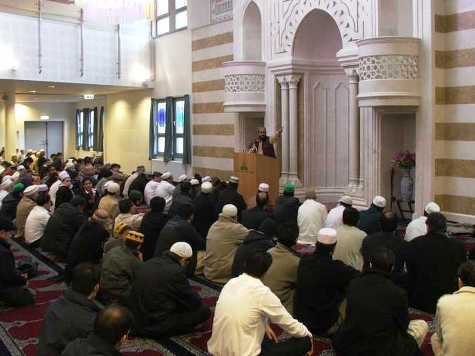 JNN 18 June 2014 Oslo : The prayers leader of the grand mosque in the Norwegian capital of Oslo was attacked by an armed individual Monday night. The Imam of Oslo’s largest mosque Nemat Ali Shah is recuperating in hospital after being attacked with an axe by a masked assailant. The Local reports that the man attacked Nemat Ali Shah as he left home to lead prayers at the Central Jamaat Ahle-Sunnat mosque on Monday, severely wounding his face and hands. Worshippers raised the alarm when he did not show up for prayers, and did not answer his phone. Mr Shah was still able to crawl back to his home, where he was picked up by an ambulance. The Imam has now been discharged from hospital after undergoing an operation last night. Norwegian police say they are treating the attack as a murder attempt, but they are not yet sure whether it was an attack by the far right or connected to his position in the mosque. Metlid pointed out that there had been previous clashes in 2005 and 2006 over his position as imam, some of which had turned violent. Police said the attacker had been wearing a green and black jacket, a hooded top, black tracksuit bottoms and white and grey shoes. They could not give a facial description. The mosque has recently been subject both to internal divisions and attacks by the far-right. During one of the disputes over the leadership of the mosque in 2006, four Muslim men attacked the congregation with a cricket bat, hammer and knives during prayers, injuring four people. The Pakistani-born Imam had been the target of an attack inside the mosque last year, too. About two percent of the 5 million residents in Norway are Muslims. Last September, a pig’s head was left outside the mosque as worshippers gathered for Friday prayers. This entry was posted in Europe and tagged ahle sunnat, Attacked with an Axe, central mosque, Imam, Lien Metlid, Muslim Prayer Leader, Nemat Ali Shah, Norway, Oslo, Oslo police. Bookmark the permalink. TALEBAAN ? AL QAEDAH ? OR ANY OF THEIR AFFILLIATES , THE SUNNI WAHABI FITNAH IS MANIFESTED EVERY WHERE . WHEN THE TIME WILL COME THAT THESE INFIDAL JEWSH WAHABIS WILL EAT THEIR DUST , SOON INSJHA ALLAH .